Wetherby Ladies secured promotion to the North East Regional Women’s Premier Division with a final day draw against league rivals Farsley. Wetherby went into the match knowing that they only needed a point to win the league outright, rather than beat Farsley to the title on goal difference. The afternoon started well, with Wetherby adopting a different formation than usual to try and contain a lively Farsley side. The change in tactics took the sting out of the game, and chances were at a premium, before Wetherby were finally able to break the deadlock, with captain Helen Hartley heading in a cross from full-back Adele Murphy’s corner. But Farsley, who won the last meeting between the sides 6-1, were not to be denied and equalised before half time. After the break, Wetherby started brightly, but they were not able to capitalise and Farsley scored to take a 2-1 lead. The scores were equalised late on however, when League top scorer Debra Slater broke to find herself one-on-one with the ‘keeper, and duly finished the chance, much to the delight of the some 300 spectators at the match. The 2-2 draw sees Wetherby join teams such as York City and Hull in the Premier division, and Manager Mike Robinson can’t wait to test his team against stern opposition. 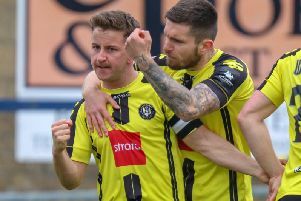 “It’s a massive achievement to get promoted and we’re really looking forward to next season, but it’s obviously going to be a lot tougher,” said Robinson. Next season will see Wetherby face a number of professional teams, but Robinson is confident his side can compete with the big names. “Clubs like Hull have a lot of money and they’re backed up by some massive clubs, and a lot of the players are paid to play. The 2-2 draw saw Debra Slater score her 26th goal of the season, and Robinson is all too aware of how rare a talent she is. “Every team needs a goalscorer, and they’re really hard to come by, so we’re very fortunate to have Debra.